Any quantity only $0.90 per oz over spot! Monarch Precious Metals is one of the more unique private minting facilities in the United States. Opened in the midst of the Great Recession, Monarch products struck a chord with investors and collectors looking for more precious metal products, especially those that were unique in the case of collectors. Today, the 1 Kilo Silver Monarch Hand Poured Loaf Bar is available as an all-new product on Silver.com. All-new product from Monarch Precious Metals! Consists of 1 Kilogram, or 32.15 troy ounces, of .999 fine silver. Hand-poured and stamped with markings. Rough, rustic finish that collectors love. Privately minted in the United States. Gold and silver bullion bars have proven a time-tested method for protecting personal wealth from the ups and downs of markets, especially in the 20th and 21st century. When the markets rumble and go through turmoil, precious metals remain as a promising option. Monarch Precious Metals not only tapped into the demand for investment-grade bullion with its gold and silver bars, it also created unique products that could attract the attention of collectors of gold and silver, as well. 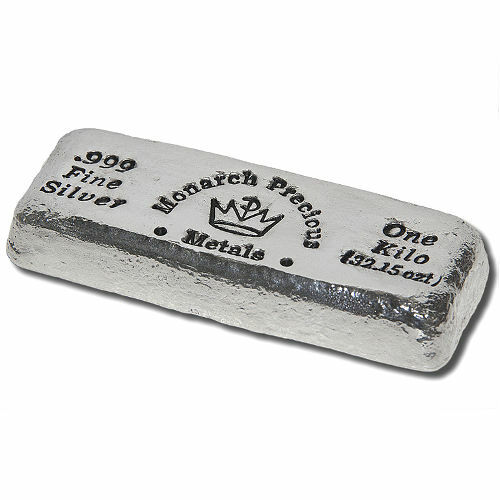 All Monarch silver loaf bars have a unique appearance that makes them attractive to collectors. 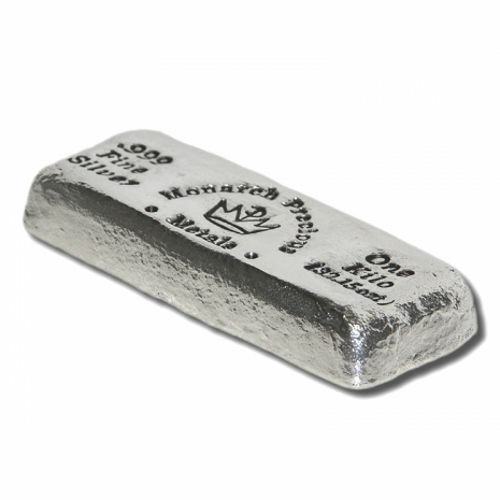 Each of the 1 Kilo Silver Monarch Loaf Bars in this product listing was struck using hand-poured techniques similar to traditional metal casting. On top of that, Monarch markings on all silver bars are stamped instead of laser engraved, further enhancing the traditional appearance of their products. On the obverse face of the bar are the only markings you’ll find on Monarch products. 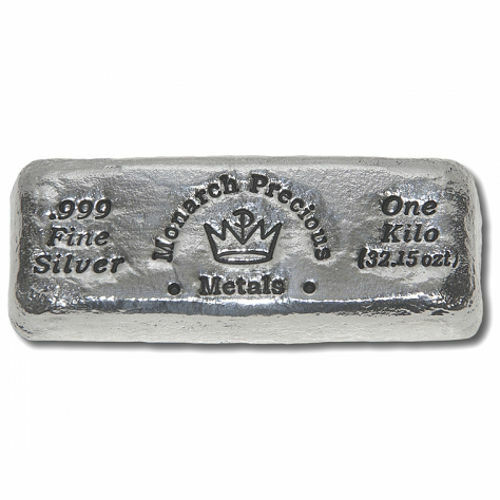 Arranged from left to right across these large loaf bars you’ll see the purity and metal content, the Monarch Precious Metals logo in the center, and the bar’s weight in both kilograms and troy ounces on the right. Monarch Precious Metals creates all of its silver bars using hand-poured techniques. Opened in 2008 in the Rogue Valley of Oregon, Monarch uses at least .999 pure silver and gold in its loaf bars, creating each with a rustic appearance that is visually appealing. If you have any questions, please contact Silver.com at 888-989-7223. We’re also available online using our live web chat feature or by submitting your questions to our email address. If you are interested in similar products, be sure to check out our full selection of Gram-Kilo Silver Bars.